The Hyundai is one of the most popular imports on the road, and Precision Auto is here to keep it that way. We design an effective maintenance service plan for your vehicle. Preventative maintenance is vital to your Hyundai’s longevity and quality performance. Precision Auto should be your first stop after your vehicle purchase. The sooner you get your Hyundai on the appropriate maintenance service plan, the sooner you’ll be on a path to optimal performance. We’re the preferred service location because we give you expert-level repairs and maintenance at an affordable rate. At our shop, you get treated like family. You can trust that your Hyundai’s services will always be necessary and beneficial to its overall performance. Keeping you on the road means keeping you ahead of any malfunctions. We got you covered from bumper-to-bumper. 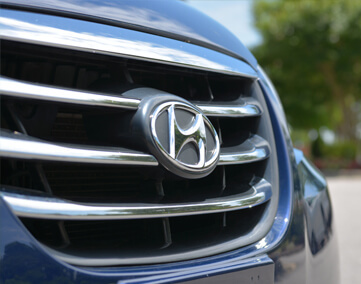 Our Hyundai experts are well-trained and experienced at providing all of your specialized services. Our specialists will consider your Hyundai’s age, your driving habits, and the manufacturer’s recommendations when designing a service plan. Come to our shop for all of your Hyundai’s services because we know the proper engine care for a Hyundai. Our quick and clean oil change services are the most important service to your engine. Protect your engine and extend its road-life by adhering to a consistent service plan. Bring us your oil changes, tune-ups, lube services, diagnostic services, pre-purchase inspections, and more to make sure you avoid costly repairs and breakdowns. Your engine repairs, mechanical repairs, and electrical system repairs are all handled with the same commitment to excellence. Experience the best performance from your Hyundai with our exceptional repair services. Our team can take care of your Hyundai’s engine, transmission, brakes, exhaust system, air conditioning, or any other repair need. Every quality repair starts with an accurate engine diagnosis. Start off on the right foot with the correct engine analysis. Your Hyundai will enjoy enhanced driving experiences and longevity. Schedule Your Hyundai Service Today! Our team is waiting for your call! Precision Auto knows how to get your Hyundai to peak performance and keep it there. Your trust is what we’re after, and our service expertise is why our customers trust us, and keep coming back for any of their Hyundai services. Give us a call today at 301-917-2682 to schedule your next Hyundai service appointment. To save yourself some time, go ahead and use our convenient online scheduling system right now! Next time you’re in the area, be sure to stop by to meet our Hyundai specialists. We’re looking forward to serving you and servicing your Hyundai.